The elegance of the Clubhouse's prime banquet area delights guests as they pass through its doors. An exposed beam ceiling, beautiful fireplace, and picturesque bay window with panoramic mountain views accentuate this grand ballroom. The accompanying veranda overlooks the South Lawn creating a perfect setting for wedding receptions, birthday parties, business meetings, and other special events. 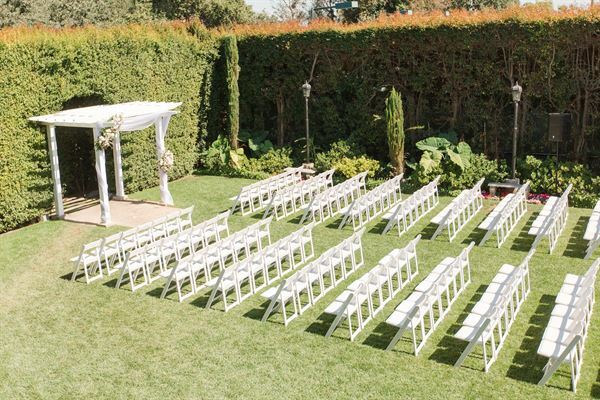 This beautiful outdoor garden setting is ideal for wedding ceremonies. Conveniently located next to the Victorian Room and Veranda, your ceremony can easily transition into a cocktail reception before your grand entrance. The South Lawn's lush, secluded surroundings offer privacy and are the perfect backdrop to capture your special memories. This distinguished meeting place is reminiscent of a magnificent mountain lodge. Gilded paintings and dark wood appointments, along with a beautiful fireplace, create a wonderful ambiance. Corporate functions find this carpeted room an ideal home, but an exposed wood floor becomes the perfect option when dancing is on the itinerary. The natural beauty surrounding the Wedding Court creates a special ambiance for your wedding or special event. The court is dressed with a distinctive arbor draped in vines and surrounded by trees, lawn, and flowers. The San Gabriel Mountains and neighboring golf course complete the picture for this unique ceremony location. Our Terrace Room offers casual elegance and intimacy for a wide range of events. The expansive windows and glass doors overlook views of the mountains, pool, and adjacent golf course. There is access to the balcony, which is a fabulous location for an evening under the stars. The Terrace Room features our exquisite custom, hand crafted, temperature controlled, wood cabinet which houses our exceptional wine collection.